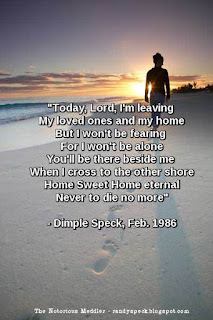 My grandmother, Dimple Speck, was born on this date, March 8, in 1918. It's hard losing your grandparents. Things never get back to the way they were. So many things in my life ended with the passing of my grandparents, Cecil and Dimple Speck, in 1986. After he died, she said that she did not want to live without him, and two weeks later she passed away. It was a sad time for my family. They were the cornerstone of our daily lives. Everything was built around them; holiday meals, love, encouragement and solid to the core advice. Suddenly all of that ended, never to be again, only remembered. I spent many nights at their home. In later years, most of my time there was spent sitting at the kitchen table listening to my grandmother tell stories that were mostly about her childhood. As I sat their listening, I would envision the things she would talk about. I think that is where my passion for writing began. Her most favorite thing to do there at her table was to read from the bible. It is said that her father would do the very same thing. The sad part of this story is that as I grew older, I let things drag me away from that kitchen table. She asked me why I had stopped coming to see her and I felt so ashamed. She died before I could get back there and I sorely regret that today. I believe the people that come into our lives; family, friends, neighbors, even strangers we meet, are there for a purpose. Some come and go while others stay around for a while. I think as we get older, we are able to retain certain memories and recall certain times in our lives for a reason. Like patchwork, the threads of life are woven together to make us what we are or what we are to become. Life is fragile and the older I get, the more aware I am of just how fragile it really is. In the two weeks between his death and hers, my grandmother began writing a poem but died before she could complete it. My dad finished it for her. Never to die no more." 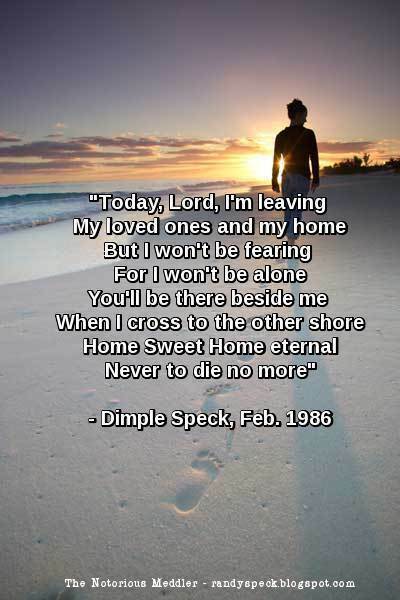 I miss Dimple Speck. Of all the things I inherited from her, the mere recollection of her is more dearest to me.